Deuce Lutui (real given name Taitusi) is an offensive lineman for the Arizona Cardinals NFL football team and a member of The Church of Jesus Christ of Latter-day Saints, sometimes casually called the Mormon Church or LDS Church. Lutui was born on May 5, 1983, in Ha'apai, Tonga. He is in his 5th season with the NFL. He is a cousin of Vai Sikahema, the first Tongan ever to play in the NFL. In the 1980's the Lutui family immigrated to the United States from Tonga, settling in Mesa, Arizona. A relative introduced the family to Mormon missionaries and eventually, the family converted to the faith. A year or so later the family was engaged in a devastating car accident on the way home from the Los Angeles California Temple. Lutui's younger sister Diana was killed in the accident, and his father suffered injuries that made him unable to work again. Lutui's mother became the bread-winner in the family, and all the children pitched in to provide basic support. Lutui was six years old when the accident occurred. The event was a huge trial, but one that has continued to cement the family and increase their connection to heaven. Lutui's father, Inoke, has supported the family spiritually, and he has devoted his hours to service in Mormon temples, doing thousands of ordinances for the dead. As a boy, Lutui loved football and the Arizona Cardinals and dreamed of playing for the team. Although his parents are quite short in stature, Lutui is an anomaly in the family, standing 6'4" and weighing 330 lbs. Lutui excelled in football at Mesa High School. In 2001, he was named Super Prep All-Farwest, Prep Star All-West, All-State, all-region and all-conference as a two-way lineman for Mesa High School. He spent a year at Mesa Community College but transferred to Snow College after the coaching staff was fired. At Snow, Lutui struggled with academic standards and problems with his citizenship (Lutui became a US citizen in July, 2010). The charitable attention of school counselor Claudia Olsen and a little help from his friends saw him through. Lutui also met his future wife, Pua Heimuli, at Snow College. She sat behind him in class, and continually tapped him on the back, because she couldn't see around him. She and Deuce now have four children, all of them born on game days. Lutui caught the eye of then-USC coach Pete Carroll and offensive coordinator Norm Chow. At the time, Lutui was the best junior college offensive lineman in the country. Chow traveled to Snow College to watch Lutui play. 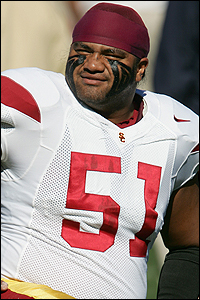 Once recruited to USC, Lutui joked that he was the only married man on the team, but not the only father. Lutui was an All-America guard for the University of Southern California Trojans. At 370 pounds, he was the heaviest USC Trojans player of all-time. Lutui developed a hunger for reading the scriptures at USC and grew in his spirituality. Norm Chow often arranged firesides with Lutui as a speaker, encouraged by football great and Mormon, Steve Young. Chow felt that people of celebrity with strong faith need to show up and serve as examples. Lutui and his wife also invited team members to dinner and Family Home Evening. Lutui was drafted by the Arizona Cardinals in the second round of the 2006 draft, and it didn't take long for Lutui to qualify as a starter. Sweet and humble off the field, Lutui is a ruthless warrior on the field. Always wanting to play the part of a Roman soldier, Lutui got the chance when he joined the cast of the Mesa Temple's Easter pageant. When members of the press heard about the event, they swarmed Lutui, but the football star would only give them a story after they toured the Mesa Temple visitors' center. The Lutui family does not attend their son's Sunday games, honoring their covenant to keep the Sabbath holy. At the beginning of each season, Lutui's father gives him a priesthood blessing to prepare him. Last August, events and schedules kept this from happening. Fellow Cardinals teammate and Mormon priesthood-holder Max Hall was happy to oblige. This page was last edited on 12 September 2011, at 12:35.